This is a sponsored post written by me on behalf of Campbell’s Soup Company for IZEA. All opinions are 100% mine. As you probably already know my girls are obsessed with all things princess related. I actually hope that I can be a princess when I grow up so I’m fine with it. Since Riley started kindergarten lunches over the weekend are more fun because it’s not normally the three of us anymore. 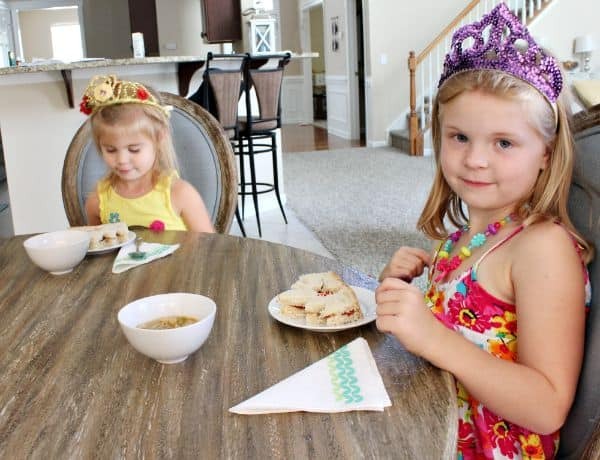 I decided to make this past weekend extra special with a Princess Lunch for Kids that any kiddo would be thrilled with. When it comes to sandwiches, my girls are pretty easy. They love peanut butter and jelly. Although, Riley prefers strawberry jam, while Avery prefers grape. I stepped it up a notch by using focaccia bread because it held the shape of the princess tiara much better. I used a 5 inch princess crown cookie cutter to create the sandwiches. I then used a 1 1/2 inch heart cookie cutter in the center of one slice of each sandwich to create the heart in the center. Once I placed the bread with the heart cut out on top of the other slice I then sprinkled rainbow sprinkles over the jam. I mean, what girl doesn’t love sprinkles, right?! The hit of the lunch wasn’t the princess sandwiches though. 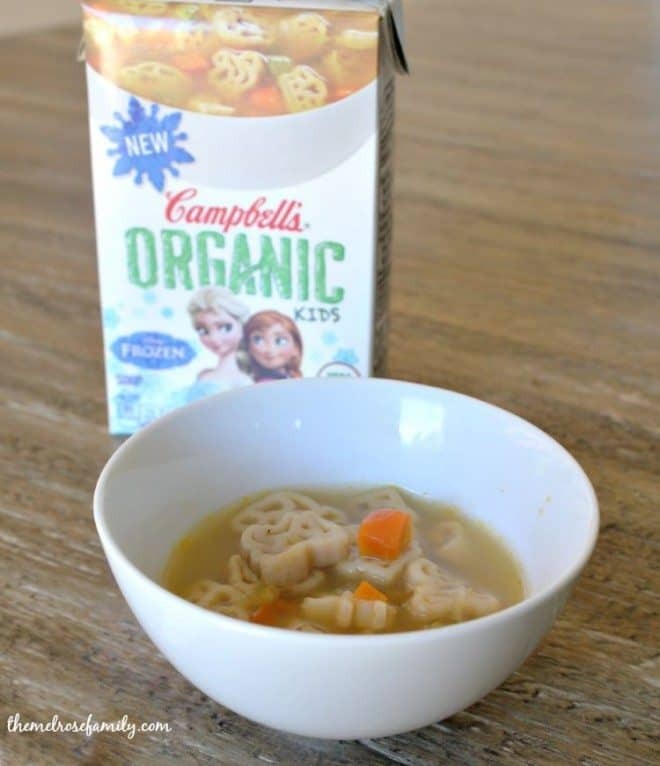 It was the Campbell’s® Organic Kids Soup that was the true hit. My girls loved the fun shapes and for once I didn’t have to battle with them about eating their vegetables. Plus, I knew that the ingredients were certified organic with no preservatives added. They were well made for real life, which has become more and more important to me as I continue on my clean eating journey. Even Avery gobbled up her soup, which is amazing considering anytime something new is set in front of her, she immediately responds with “Yucky” and wrinkles her cute little nose. Why do they always have to be so darn cute right? I swear she is getting away with so much more than Riley ever did and aging me much faster as well. Thank goodness she’s my last! My favorite part of lunch was the end when Riley stated, “This was the best lunch EVER.” I love being able to create these tiny moments with them that means so much more than I will ever realize. 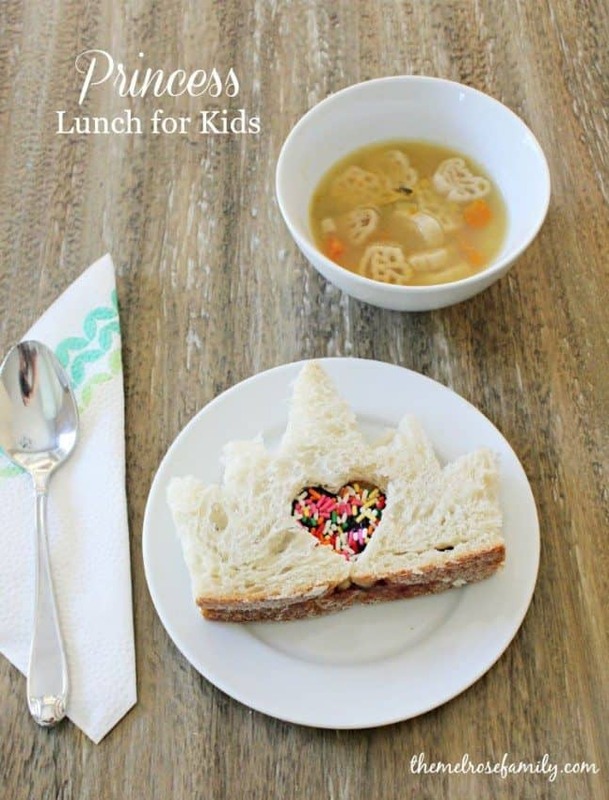 Plus, it’s super easy to accomplish since there are so many Delicious Campbell recipes that make it easy to provide a healthy lunch in a fun way thanks to @Campbells. 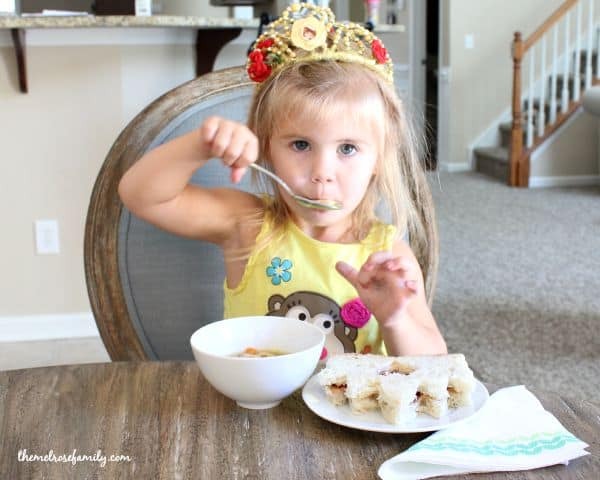 A simple yet super cute princess lunch. Cut out the focaccia bread using the 5 inch princess crown cookie cutter. On on of the slices of crown cut out bread, cut out a heart using the 1 1/2 inch heart cookie cutter. Place the peanut butter and then the jam on the whole slice crown shaped bread. 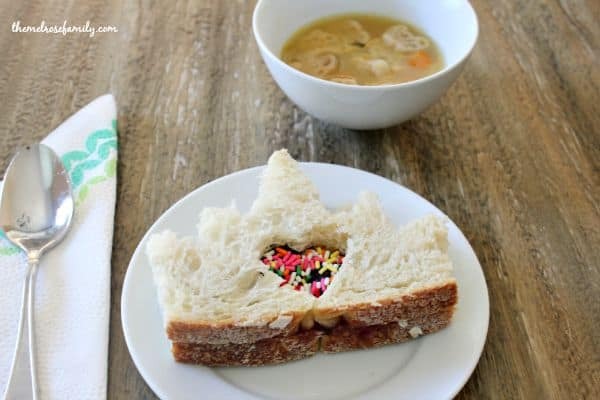 Place the slice of bread with the heart cut out on top of the other slice. Pour sprinkles over the jam in the heart shape and serve.